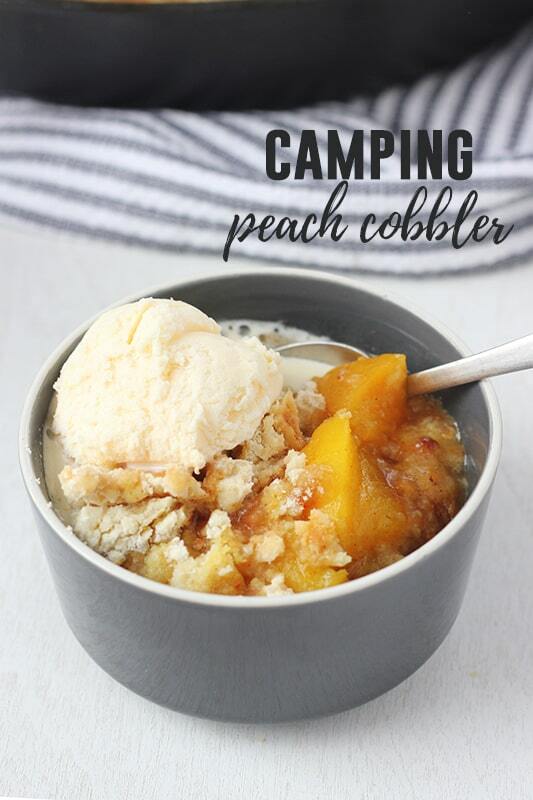 Camping Peach Cobbler Recipe. 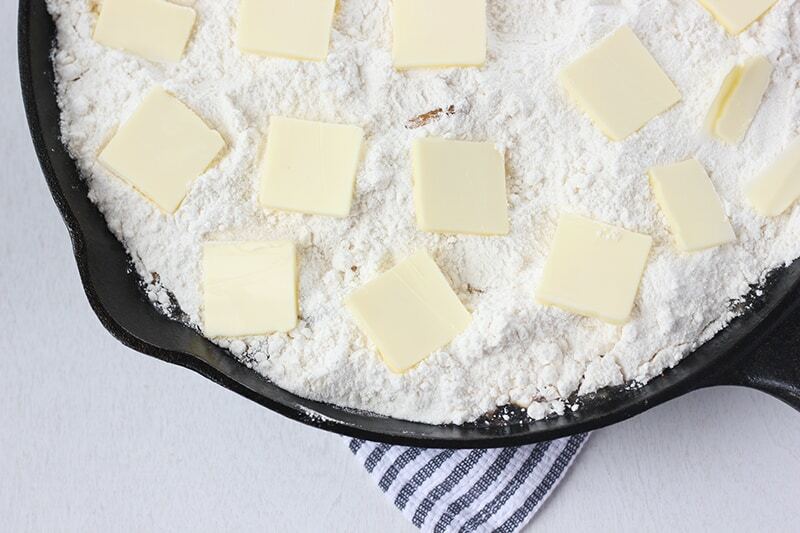 This easy dessert is the perfect cast iron recipe to finish off any meal! All you need are cans of peaches, a yellow cake mix, cinnamon, and butter! Camping food has a special place in my heart. I am a firm believer that you should be able to enjoy good food while camping, and it should not be difficult. That is where this cobbler comes in. My husband calls it the “lazy girl” recipe. You only need 5 ingredients and it is ready to start baking in as little as 5 minutes. Did I mention that it tastes incredible? You get the homemade flavor of cobbler while using the ease of a cake mix. 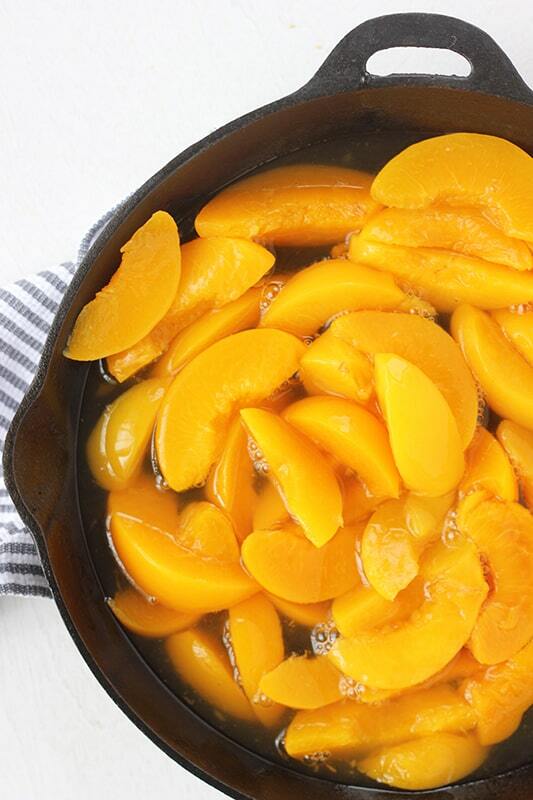 Open your canned peaches and pour into a 12 inch skillet. Cover with your cake mix. Straight out of the box. Can you believe how easy this is? My brother and sister are actually the ones that introduced me to this sweet treat! They also introduced me to dutch oven liners. Pop one of these into you pan and clean up becomes a breeze! Like this recipe? You will love my Baked Bean Camping Chili, Sweet Potato Breakfast Hash, and Cast Iron Apple Baked Pork Chops! Is cast iron good for camping? YES. I get this question a lot. Cast iron is wonderful for camping. It is incredibly durable, easy to care for, and practically made for fireside cooking! It is easy to clean and affordable! I talk about all of this in my cookbook: Cast Iron Kitchen! How do I clean my cast iron while camping? 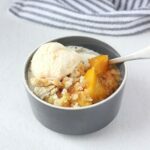 This easy dessert recipe is the perfect finish to any camping meal! 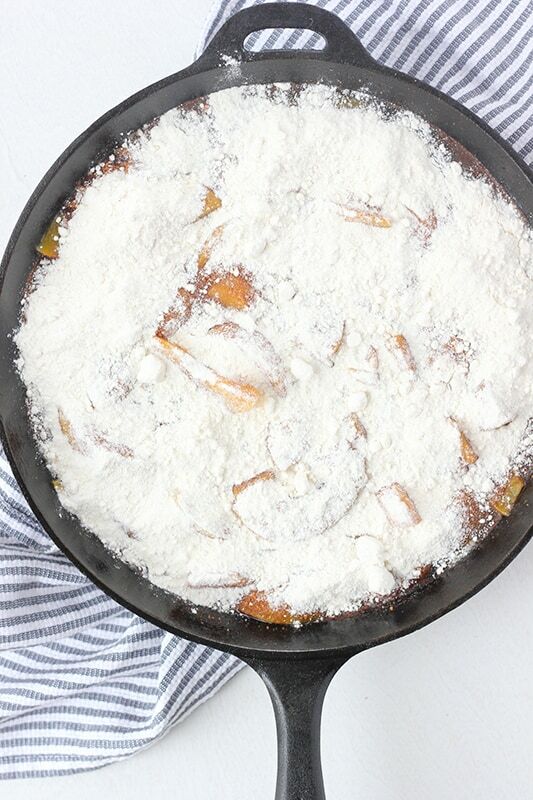 Pour the peaches into a 12 inch cast iron skillet or dutch oven. Mix together the brown sugar and cinnamon. Sprinkle over the peaches. Evenly pour the cake mix over the top of the peaches. Preheat your oven to 350 degrees. Bake your cobbler, uncovered, for 45 minutes or until a toothpick comes out clean. 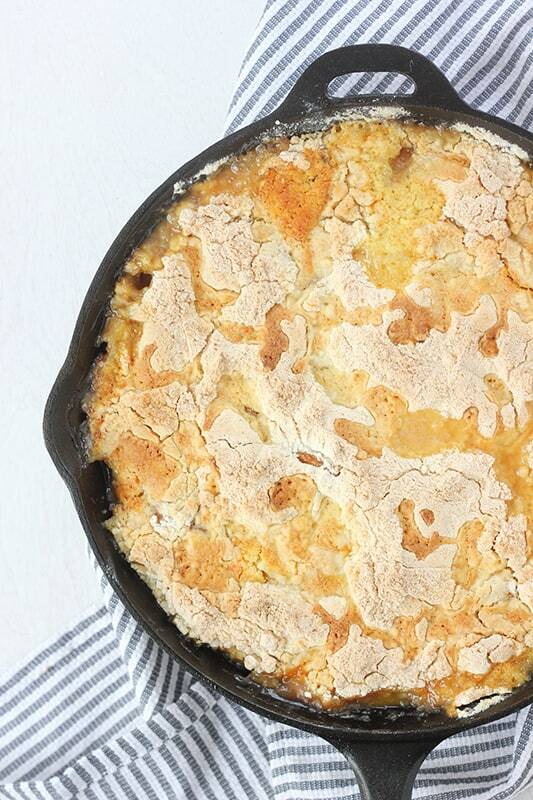 Place the lid on your dutch oven. Place ten hot charcoal briquettes on the lid. Allow to cook for 45 minutes or until a toothpick comes out clean. Are those the “big” cans of peaches? Or the smaller 15oz cans? Sounds wonderful! It’s two 30oz cans. Drained. I totally messed that up in the post. Thanks for catching it! Looks uber yummy! What is the foil you use in there, did you just make your own foil “bucket”, or did it start life as something else? Also, I’ve made something similar but without the Sprite. Any ideas on what the Sprite contributes? Been enjoying reading your blog! Sometimes, in the camping department, you can find foil dutch oven inserts. I’ve also heard that they sometimes have them in local grocery stores as well. That’s what the foil insert is. As for the sprite… I’m not sure why, but by using the soda you are able to eliminate the eggs, oil, and water called for on the box. I’ll have to do some more research though. The sprite is the leavening agent. What gives the “rise”. put the pie filling the Dutch Oven. Top with dry cake mix. Slice butter and lay slices on top. PUt coals under and over. About 30-45 minutes and you have an awesome cobbler. Try apple pie filling with cinnamon swirl cake for a yummy breakfast. This is good even if you aren’t camping. My family calls this “dump cake”, thought I can’t figure out why. Cherry filling really works well. We love cherry filling too! Uh, YUM! Never thought about something other than white or yellow cake mix (I’m creative like that–not). Apple pie filling with spice cake! Holy crap…a whole new world just opened for me. lol The cinnamon swirl sounds good too, but I love me some spice cake. What if I wanted to make this using a traditional oven…what would the temp be and for how long? I’ve made this before but used diet cream soda instead of the sprite. Delicious! Of course that was for blackberry pie and the berries were pretty tart.. may give it a try with this too anyway. Could I do this on a Coleman stove (the area I’ll be camping in has a no-fire policy right now so I can’t have coals! I have made it on a stove top with a 10″ cast iron dutch oven. Works great no problems. I use half a 16.5 oz package of yellow cake mix or one full box of 9 oz jiffy cake mix. Normally I use two drained cans of either sliced peaches or pineapple chunks. I substitute generic grapefruit soda for the 7UP. And I start with one stick of butter. Melt one stick of butter in the dutch oven with a foil pan liner. Sprinkle a little bit of brown sugar over the top of everything. Put the dutch oven lid back on and let it set for about 10 to 15 minutes. How many coals are used – top & bottom please? Im feeding a crowd of 150 for an event…how many serving per dutch oven? I figured about the same as a 9 X 13? So-15-18? My number should be around 10/11 pots? I’d say more like 10-12 per pan. How many charcoals do you use on both the bottom & top? I’ve bern told that makes a big difference in your temperature of the oven. what size Dutch oven are you using? Camping for the 4th of July and would love to make this. You could also use a box oven the old girl scout way. Line a heavy duty cardboard box with heavy duty foil. Make a rack to set the pan on with a wire cooling rack and four empty pop cans for support. Set it on level ground, and find a small rock to put under one edge of the box to vent. Count about 50 degrees per briquet. Can this be done in an oven on a smaller scale?? We are a family of 4, & the above seems like a lot. I usually just use a small 8×8 pan and one 15 oz. can of fruit. We don’t eat alot of sweets at once. How would I make this like that?? Could I just cut it in half and still use the mentioned oven temp and time?? Thank you. We are a family of three so I definitely understand the need to cut back a recipe. 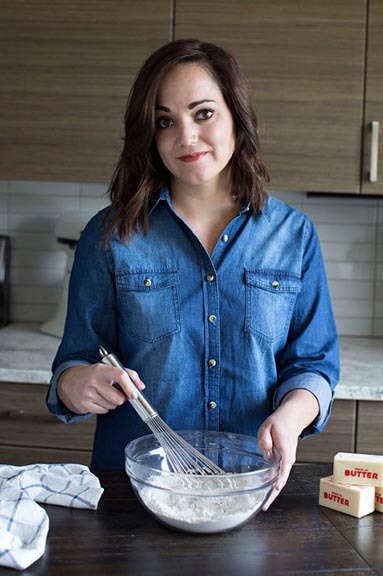 I would do as you stated and cut the ingredients in half (maybe not the butter topping) and check your cobbler around 30 minutes. Using a regular 8×8 pan shouldn’t be an issue.